There's a famous saying, I'd rather have a palapa in Yelapa than a condo in Redondo. It made me laugh out loud the first time I heard it. Being from Southern California myself, I can tell you honestly that the condo's not so bad. Live any close proximity to the ocean, and I consider that blessed. But, it did get me thinking about exploring this little-known gem of a fishing village tucked away in the Mexican Pacific coast. I've been traveling in and out of the Puerto Vallarta aiport consistently for the last four years. Usually, as soon as we land in PV, I high-tail straight up north to the bohemian pueblo de amor of Sayulita (in the Mexican state Nayarit) where I teach yoga and lead adventure retreats. Rarely ever do I get to venture south of Vallarta. 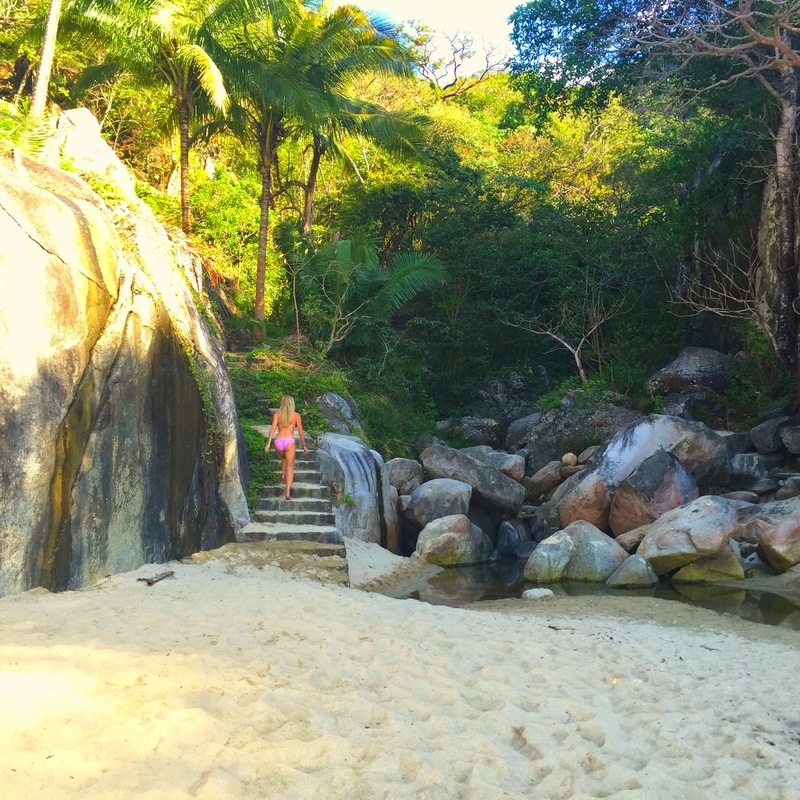 But, having heard rumors of magical jungle hikes through tribal land to giant waterfalls, and it being Bob Dylan's personal shelter from the storm in the 1970s, where he would retreat and find new creative inspiration, I finally took the opportunity to travel to Yelapa and see for myself what the hype is all about. After spending 5 days there, I can tell you that I'm so happy I went. And you should too! Yelapa has something for everyone. The most rustic jungle lodges are nestled adjacent to luxuriously elegant villas. The all-day hikers and explorers share stories and margaritas at night with the sandy beach bums who never moved an inch all day. There's a palapa in Yelapa for everybody -- and that's just part of its charm. Here's my step-by-step guide of this world-class travel destination that you've probably never heard of . . .
1) How to Get There: After an easy 3 hour direct flight from San Diego, the adventure begins. Yelapa is only accessible by boat, so if you're not comfortable embracing the life aquatica, then this definitely is not the place for you. You catch a water taxi from either Los Muertos pier in Vallarta or from Boca de Tomatlan pier. From Muertos, it's about an hour boat ride to Yelapa; from Boca about 30 minutes. Grab a few cervazas before you hop on the water taxi (be sure to hook your boat driver up with one!) and it's all smiles as locals and tourists become friends on the high seas. Once you arrive, you'll realize that the town has never been touched by vehicles, and there is a certain serenity to the fact that everything moves at a leisurely pace. No rush is the mantra in Yelapa. 2) Where to Stay: Hotel Lagunitas was the perfect fit for us. Charming and minimalist, with sand at our doorstep. Most places in Yelapa have little to no internet access, especially the higher you go into the jungle, so we chose Lagunitas specifically because there is a bit of reliable WiFi in the hotel reception. That came in handy big-time when my husband got an urgent work email during our stay, and was able to FaceTime with his business partner. All in all, it was the perfect place to kick back and watch some amazing sunsets from bed. 3) What to Do: After two days of laying face-down in the sand and having our margaritas replenished every hour, on the hour, it was time to move around! Yelapa has miles and miles of dense jungle that is just begging to be explored. 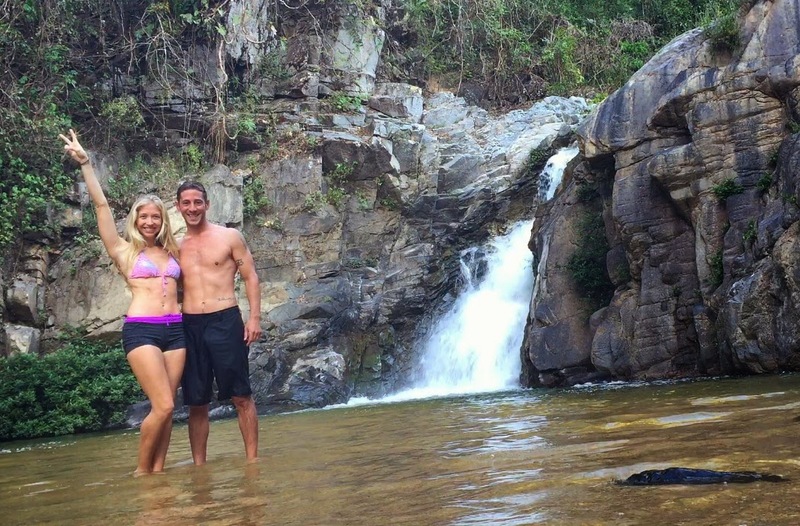 Its most famous hiking trails lead to its 2 signature waterfalls. The first, most accessible waterfall is located a short 20 minute hike from town. That one was OK but over-run with tourists --meaning there were about 12 people ther. We had heard rumors of the second, more important waterfall, some locals called it Cascada Catedral, located a 2 hour hike deep into the jungle, each way. There are no markers and no signs, just some shady, contradicting directions we had received from a variety of hotel staff. We were down for the adventure, so we put on real shoes for the first time in days and set out to explore. We soon found out that people live along about 75% of the trail, up until you get really deep into the jungle, so just smile and ask for directions and they'll point you along until you need more help, and someone else will appear. It was a crazy experience, where we came across tons of sketchy wildlife (including coming face to face with multiple Coati -- a giant orange raccoon creature) but arriving at this huge mystical waterfall and feeling the vibrational healing of the earth and water elements colliding was so worth it. 4) Where to Eat -- put this on your bucket list, immediately! Ocean Grill is my new favorite spot to recommend to anyone that loves the mash-up of adventure and rustic luxury. It's reminiscent of the Amalfi Coast in the summertime, with a touch of European flavor and that amazing Mexican hospitality. There are only 3 reservations per day, so you must book online in advance of coming. Do not try to just show up in a water taxi -- we saw multiple people get turned away, even in yachts! The owners are down-to-earth and treat everyone with equally impeccable service, as long as you respect their policy of pre-booking. Once you're there, you'll understand why. Absolutely everything is hand-made or brought in from nearby. The octopus and oysters were caught off the pier and they want everyone to have enough space and time to enjoy the property. After eating the most delicious meal, you have time to explore the private beach and jungle on-site. The last water taxi leaves Ocean Grill at 5pm, so take the earliest reservation possible to enjoy this unique concept to the fullest. 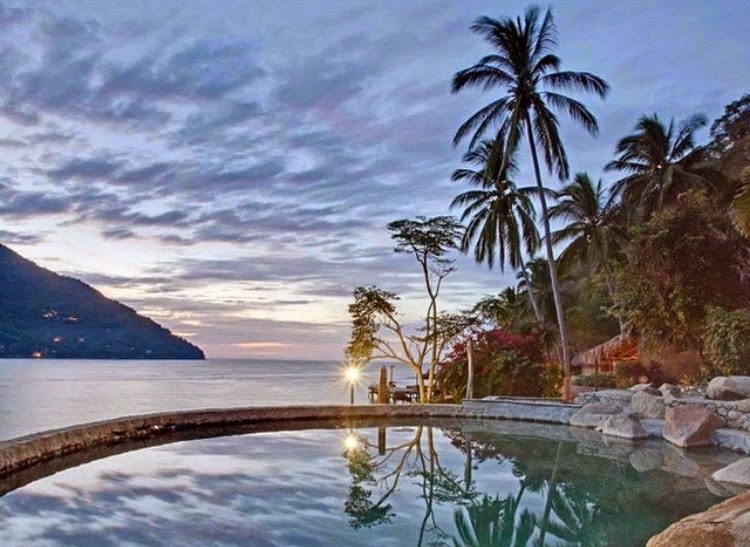 5) A Special Treat: When I go back to Yelapa one day, I'll make sure to treat myself to a stay at Xinalani, or maybe even bring a yoga retreat group there. This award-winning center is tucked away on a private beach a few minutes boat ride north of Yelapa, near Boca de Tomatlan. This is the mecca for yoga, meditation and healing treatments in the area. Drop in for a personal stay or hop onto one of their existing yoga retreats and indulge. Everything about our trip to Yelapa was a beautiful contradiction and stimulating to the senses. The warm smiles of the local people, the delicious fresh caught fish, the laid-back pace, mixed with the intensity of the jungle that draws you in deeper and deeper until you find exactly what you are looking for.